We are here to help you find high-end countertops you want to add to your Columbus home. High-end countertops can make a big difference in the overall look and feel of your kitchen. When you’re planning a renovation or constructing a new home, you have a variety of options available. Some of the most high-end countertop materials include marble, granite, and quartz. Natural stone comes with a number of benefits. Certain types of stone are very durable, requiring minimal maintenance. Granite and quartz can also typically withstand spills and mishaps in the kitchen. Simply wipe the countertops with a soft cloth and the proper cleaning solution, and they should look as good as new. Another benefit of high-end stone countertops is the uniqueness of every slab. No two pieces of stone are exactly alike, so your home will have a different look even from someone who chose a similar style and color scheme. Adding high-end countertops is always valuable, as they are always in style. 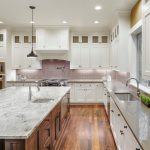 If you plan to sell your home in the future, the countertop choice you’ve made could play a big role in the minds of any potential buyers. Natural stone can be cut to fit any space, whether you have traditional rectangular countertops or a rounded vanity. At The Granite Guy, we are here to help you find high-end countertops you want to add to your Columbus, Ohio home. We carry a wide selection of high-end options, including marble and quartz. If you prefer granite, check out our exotic options that are more eye-catching and visually appealing for a bold homeowner.